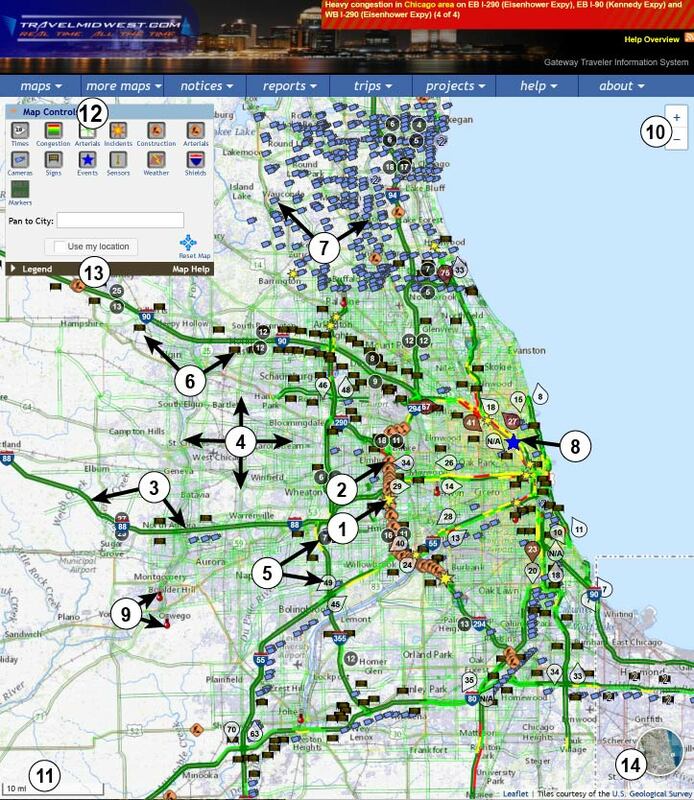 The Travel Midwest site includes interactive map pages that present traffic information graphically. The maps are generated dynamically and display up-to-date traffic conditions in the form of colored areas and icons. The maps provide a way for you to quickly get a picture of the current traffic conditions in various parts of the site's coverage area. The maps are not updated automatically, but you can update the information presented by refreshing the page in your browser. The maps are accessed via the "Maps" menu header in the menu bar. Selecting "My Map" displays a map whose configuration is stored in a cookie on your browser so that you can use it to get a map of your preference quickly. Selecting the "Chicago Area", "City of Chicago", "Bloomington/Normal", "Champaign/Urbana", "Effingham", "Kankakee", "Lake County IL", "Peoria", "Quad Cities", "Rockford", "Springfield", "St Louis", "NW Indiana (Gary)", "Detroit", "Grand Rapids", "Lansing", "Minneapolis/St. Paul", "Madison", "Milwaukee", "Des Moines" or "Toledo" menu item displays a map initially centered on that location. The map pages display a map that takes up the entire browser window with three control panels on the left side on top of the map. Each control panel can be expanded to use it or view its contents, or can be collapsed to display more map area. The maps can be scrolled and zoomed to allow you to view the area in which you are interested, at the desired level of detail. The magnifying glass controls (the two rightmost icons in the last row of the "Map Controls" control panel, 13 in the figure below) allow you to zoom in and out. To scroll the map, press the mouse within the map image and drag the image in any direction. When you release the mouse button, the map will be redrawn at the position to which you moved it, filling in the areas that were left empty when you dragged the image. The button with four arrows pointing to the center resets the map to its initial configuration. All the buttons in the Map Controls panel can be operated with the keyboard: press Tab or shift-Tab to navigate to a button and then press Enter to activate it. Depending on various factors, it may take a few seconds for the map to reload. The map will not scroll beyond the coverage area, so it may not scroll the full amount when the edge is encountered. Information on the maps is displayed in layers. 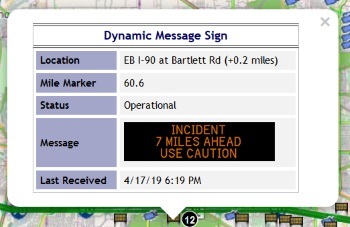 There are layers for travel times, congestion, construction, incidents, road labels and shields, dynamic message signs, cameras, special events, and weather. Layers may be displayed or hidden using the toggle buttons in the Layer and Zoom Control panel on the map page to allow you to focus on the information you find useful, and to remove information you do not find relevant. Initially, all the layers are displayed. As you scroll and zoom a map and turn layers on and off, the location, zoom and layer information is stored in a cookie on your browser. In this way, you can refresh the map to update the real-time information without losing track of the area and the types of information you were viewing. The cookie for the "My Map" page is maintained for three months so that your preferred map configuration will be ready to use when you return to the site. If you have disabled cookies for your browser, then you will not be able to use this feature. Because of the size and complexity of the maps, the time it takes to generate them and send them from the Travel Midwest site server to your browser may be noticeable. Please have patience as the maps load. When using the map controls, please wait for the effect of a click to be displayed before clicking again. Incident - These icons indicate that there has been an incident such as an accident reported at this location, which is believed to still be currently affecting traffic conditions at that point. The effect will vary from incident to incident. A large icon indicates the incident duration is estimated to be over an hour, while a small icon indicates that the estimated duration is less than an hour. A red icon indicates that all lanes are closed, and a yellow icon indicates a partial lane closure. A green icon indicates there is residual congestion from a recently cleared incident. Section Construction - The jagged orange lines along a roadway indicate that there is construction or maintenance activity on the indicated section of that roadway. In some cases, indicated by a darker orange, this activity might be moving along the section indicated, so the entire section is not affected at a given time. In other cases, indicated by the lighter orange, the whole section is most likely affected. Point Construction - The construction worker icon indicates that there is construction or maintenance activity at the location indicated by the icon. In the case of point construction, the activity is occurring in a small area and not along a length of roadway. Only roadways which are equipped with detection equipment are colored in this way. 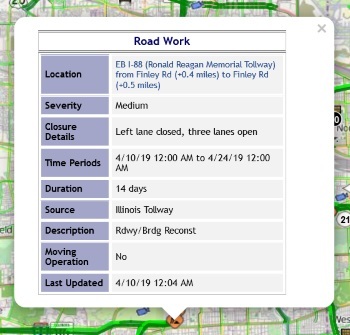 If a roadway has such equipment, but the Travel Midwest site is unable to determine the current congestion (e.g., due to a communication error), the roadway is colored gray. Expressway and arterial congestion can be toggled independently via the Map Controls. Travel Time - The white teardrop and black circular icons with numeric labels display up-to-date travel times. In the Chicago area, the teardrop icons display the travel time to or from the Chicago downtown area to the location of the icon, with the point of the teardrop indicating the direction of travel. The black circular icons indicate the travel time on a roadway section. As discussed in the next section, you can click on a travel time icon to determine the end points for that icon. A dark red teardrop or circular icon with a numeric label indicates that the given travel time is 50% higher than the average travel time for the current time of day and day of week. Dynamic Message Sign - This icon marks the location of a roadside dynamic message sign. Camera - This icon marks the location of a camera. In some cases, especially when the map is zoomed out and there are several cameras very close together at that zoom level, a single icon represents a group of cameras. Special Event - This icon indicates that there is a planned event at that location which may affect traffic conditions. Road Labels - The numerical designations of major roads are shown using the customary shield icons. Road names are also displayed, depending on the zoom level. Airport - This icon indicates an airport. Clicking on an airport icon opens a window displaying the home page of that airport (if any). Weather Station - This icon marks the location of a weather station. The "Go to city" feature centers the map on a city that you select. To do so, enter the first few characters of the city name in the field and a menu of matching cities will be displayed. Choose a city from the menu to center the map on it. The "Use my location" feature allows you to keep the map centered on your device's location. When you check the check box, your browser may ask whether to permit the application to use your location. This feature will not work if you deny permission to do so. If your device moves while the "Use my location" check box is checked, then the map will re-center itself to follow your device's location. You may zoom in or out without affecting the "Use my location" feature. However, panning the map or using the "Go to city" feature will disable the "Use my location" feature since you are selecting a map location. The twelve toggle buttons in this panel control which layers are displayed on the map. Clicking on a button will hide or show that map layer. If the button appears pushed in, that layer is visible. If you hover your mouse over the button (without clicking), a tool tip will appear that indicates which layer the button affects and whether that layer is currently visible. When the map is zoomed out, some layers are disabled to reduce the clutter on the map. If a layer is disabled, the tool tip will indicate that. In order from left to right and top to bottom, the buttons affect the following layers: Travel Times, Expressway Congestion, Arterial Congestion, Incidents, Cameras, Special Events, Expressway Construction, Arterial Construction, Weather Warnings, Road Labels, Dynamic Message Signs, and Weather Stations. The button with four arrows pointing to the center resets the map to its initial location. The magnifying glass controls at the lower right of this control panel cause the map display to zoom in (+) or out (-). 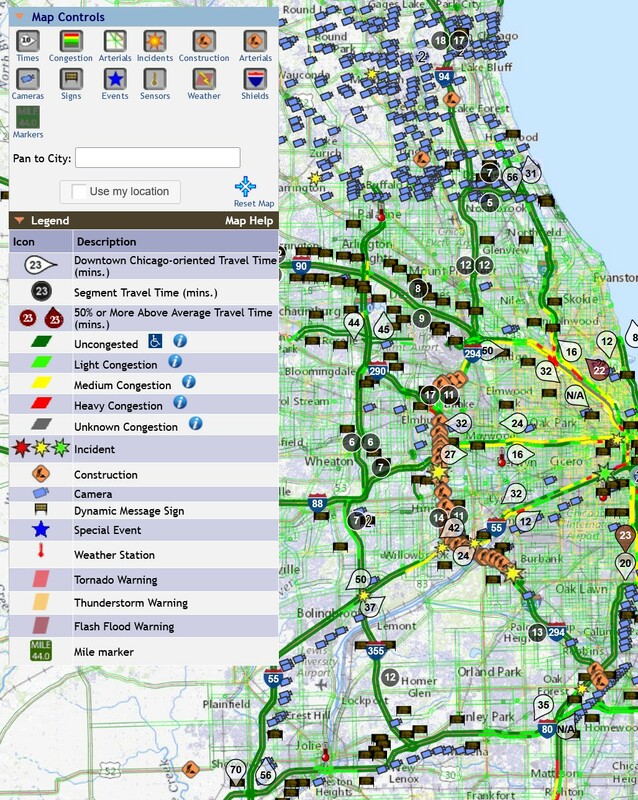 The Legend - The Legend (shown in the above figure) identifies the icons and congestion color coding used to display traffic conditions, events, and devices on the map. The "Map Help" in the Legend title bar is a link to this page. If you have difficulty distinguishing the congestion colors on the map and reports, you can click on the ADA icon next to "Uncongested" in the Legend to open a window that lets you set the color for "Uncongested" to blue, which is easier to distinguish from the red for "Heavy Congestion" and the grey for "Unknown Congestion". The Info Viewer - The Info Viewer displays information about icons or congestion colorizations that you have clicked on the map. As you click on an icon, detailed information about that event, device, or traffic condition section is added to the Info Viewer. The Info Viewer allows you to see information for several traffic condition sections, events, or devices in which you are interested at the same time. Camera - the most recent snapshot received, the location, and last update time. If a camera icon represents more than one camera, an entry for each is added to the Info Viewer. Clicking on the snapshot displays a small window with the snapshot enlarged together with reference views that you can use to determine in which direction the camera was pointed. Clicking on the location opens a page displaying a map zoomed to the location of the camera. Which control panels you have open and closed are stored in a cookie so that when you refresh a map page or navigate to another map page, the same configuration will be maintained. In addition, the items you have placed in the Info Viewer are maintained in a cookie so that they will still be available in the Info Viewer on any map page. These cookies are maintained until you quit the browser. As stated above, selecting the "Chicago Area", "City of Chicago", "Bloomington/Normal", "Champaign/Urbana", "Effingham", "Kankakee", "Lake County IL", "Peoria", "Quad Cities", "Rockford", "Springfield", "St Louis", "NW Indiana (Gary)", "Detroit", "Grand Rapids", "Lansing", "Minneapolis/St. Paul", "Madison", "Milwaukee", "Toledo" or "Des Moines" menu item from the "maps" menu displays a map initially centered on that location. However, a user may regularly view the map of a particular location and wish to view that map without scrolling and zooming one of the preset maps. The "My Map" feature addresses this need. To set your preferences for "My Map", select "My Map" from the "maps" menu and scroll and zoom the map and set the layers you wish to see. This information is stored in a cookie on your browser for three months so that your preferred map configuration will be ready to use when you return to the site. Your map is then displayed on the Travel Midwest home page when you return to the site, and is available at any time via the "My Map" menu item.